Rediff.com » News » Has the era of strong chief ministers come to an end? Has the era of strong chief ministers come to an end? 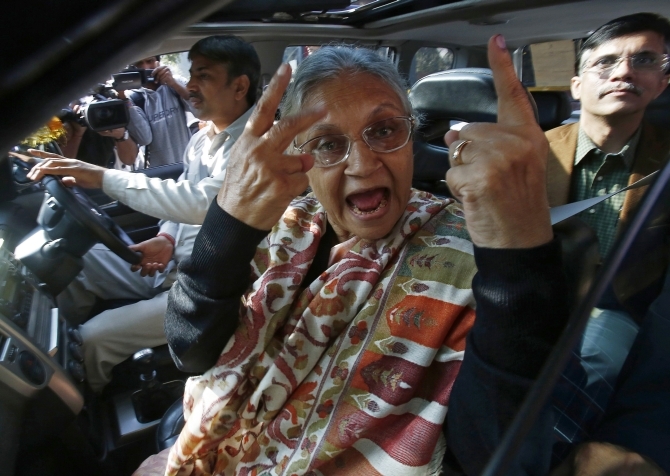 Sheila Dikshit, who ruled Delhi as its chief minister for 15 years, lost the recent elections. 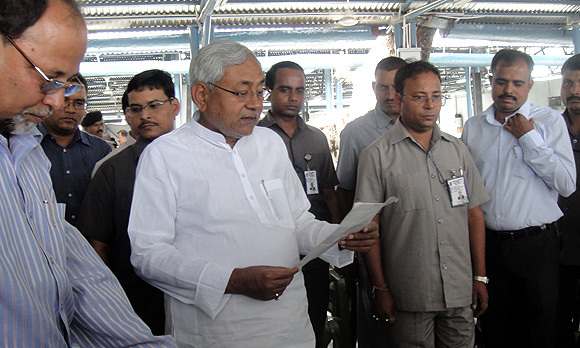 Bihar Chief Minister Nitish Kumar, often called the turnaround leader, is reported to be on a sticky wicket following his party's break-up of an alliance with the Bharatiya Janata Party. Some of the recent decisions of the Naveen Patnaik government in Odisha seem to have created doubts in the minds of investors. 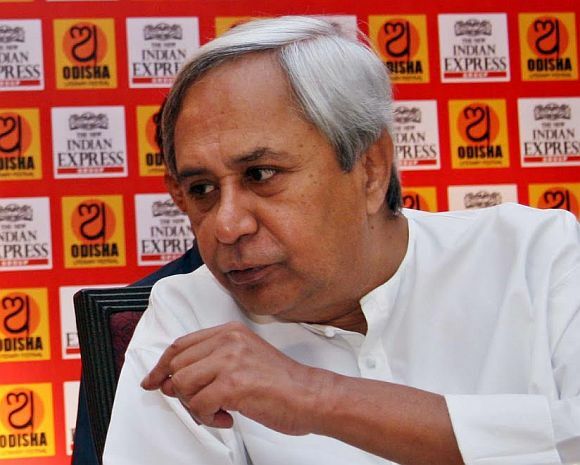 Dikshit, Kumar and Patnaik were hailed as strong leaders, with some others, and credited to have taken their states to a high growth path. Others on the list include Gujarat Chief Minister Narendra Modi, Madhya Pradesh's Shivraj Singh Chouhan and Chhattisgarh's Raman Singh. Ruchir Sharma, head of emerging markets and global macro at Morgan Stanley Investment Management, called these "breakout states" because of their "rapid and sustainable growth rates". He wrote in a recent essay: "States still growing at or near double-digit rates represent India's secret weapon for competing with the other major emerging markets, from China to Brazil, Indonesia to Mexico." Recent economic successes of these states were made possible by political longevity of these leaders. Sharma argued that good economy made sound political sense as well. "In the 30 state elections since 2007, 50 per cent of the incumbent chief ministers have won re-election, compared with just 25 per cent in the preceding three decades; nearly 66 per cent of those re-elected had delivered five years of growth that was faster than the national average." Is the era of strong CMs getting over with the electoral reverses of some and relative decline of some others? Has the country lost its "secret weapon for competing with" growing countries like China and Brazil? Sharma remains optimistic still. In an emailed response, he says, "Both Naveen Patnaik and Nitish Kumar appear to have hit some speed bumps but I still think they are strong enough to carry on with the development agenda." His optimism stems from the fact that "as long as the message keeps spreading that economic development is a major factor at the ballot box and states keep throwing up decisive mandates in favour of strong, growth oriented leaders that will be a real positive for India to counter the gloom at the centre." A recent study by Milan Vaishnav and Reddy Swanson for Carnegie Endowment for International Peace takes this point forward and argues that good economics indeed is becoming good politics. According to the study, "statistical analyses, after controlling for a range of factors, reveal that a 1 percentage point improvement in a state's growth rate in the 2000s is linked to a greater than nine per cent increase in the likelihood that the incumbent will be re-elected, a four percentage point gain in seat share, and a 1.3 percentage point rise in vote share." The outcome of the recent Assembly elections vindicates Sharma's optimism. Political commentators point out Dikshit's exit from the list of strong leaders will be compensated by the entry of Vasundhara Raje Scindia in Rajasthan, as she too has won a very decisive verdict. And the re-election of Chouhan and Singh shows states' tryst with strong leaders is likely to continue, they said. However, some of the erstwhile "breakout" states seem to have hit roadblocks. The Patnaik government, for instance, has put on hold processing of all coal block allocation applications, causing further delay to many big-ticket investments which are already suffering from time and cost overrun. The ensuing delay will not only mean less indirect revenue for the state but also deprive it of royalties that would have accrued from coal production. The coal sector is not the only casualty of the state government's inaction. "Iron ore production has fallen by nearly 20 per cent in the state since 2010-11. Because of a high export duty and differential railway freight rate, margins in export of iron ore have reduced, leading to a substantial stockpile of the important mineral in the state," said Jayanta Roy, senior vice-president at rating firm ICRA. In 2010-11, Odisha produced 77 million tonnes of iron ore which fell to 62 million tonnes in 2012-13. The fall in output is a result of a series of government decisions which has led to considerable uncertainty among investors. One of the several decisions has been the instruction to miners not to sell more than 50 per cent iron ore outside the state. And the iron ore can be sold only through e-auction platform. As the e-auction platform is yet to become operational, the state is sitting on stock inventory of nearly 45 million tonnes. This is clearly bad news for a state where mining contributes nearly 12 per cent of its GSDP and is a major earner. But then the logic of good economics is good politics is likely to ensure that "break out states" come back to a higher growth path.